Self-catering accommodation at the 4 star Groudle Glen Cottages in Onchan with a Welcome Pack of essential Manx produce. Four Manx National Heritage Holiday Passes. Four Curraghs Wildlife Park tickets. Steeped in history, nature and wonder, the Isle of Man is a magical place to visit for the entire family. Sitting in the heart of the Irish Sea, the island is easy to reach with sailings from Heysham, Liverpool (Birkenhead, November - March) and seasonal services from Belfast and Dublin, when you travel by ferry you can pack everything you'll need for an unforgettable trip as there are no luggage fees to worry about. The Isle of Man's beautifully diverse countryside provides the perfect playground for those who enjoy the great outdoors. Whether you enjoy a relaxing stroll in the countryside, love getting out on your bike, splashing about in a sea kayak, monkeying around in tree tops and anything in between the island is the perfect destination for you. For history buffs and cultural enthusiasts the Isle of Man has a unique history and rich culture that stretches back over 10,000 years that you can enjoy any time of the year. Whilst on the island, be sure to taste some of the outstanding local delicacies including queenie scallops, Manx Loaghtan lamb, delicious Manx ice cream and wonderfully smokey kippers. Venture to the Ballaugh Curraghs,wetlands found in the north of the island, for a chance to spot wallabies in the wild. Whilst there enjoy a fun day out at The Curraghs Wildlife Park, home to endangered species, large cats, birds of prey, primates and family favourites such as Meerkats and Prairie Dogs. You can travel back in time to the Victorian heyday climbing to the summit of Snaefell, the island’s highest point, on the Electric Mountain Railway or Hop on board the Steam Train to the south of the island where you can enjoy a family picnic on one of the many sandy beaches the Isle of Man has to offer at Port Erin. 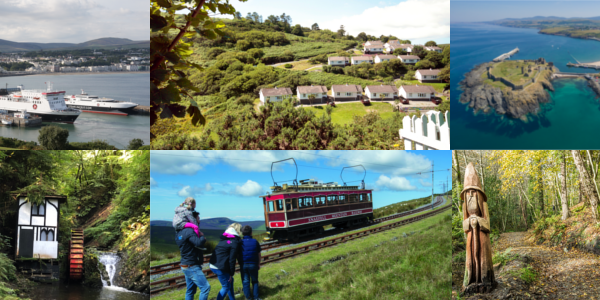 Groudle Glen Cottages are set in a beautiful hillside location, overlooking one of the island’s 18 mountain and coastal National Glens that boasts its own miniature steam railway, The Groudle Glen Railway. Beyond the glen the cottages are privy to panoramic views, both inland and out to sea, and are located just 3 miles from the island's capital, Douglas, where you will find plenty of amenities including the Sea Terminal where our ferries dock. Groulde Glen is also a stopping point on The Manx Electric Railway, which celebrated its 125th anniversary in 2018. The vintage railway transports passengers between Douglas and Ramsey. Stopping along the way at various beauty spots along the east coast including at the beautiful former mining village of Laxey where amongst other points of interest you’ll find The Great Laxey Wheel, the largest working waterwheel in the world. So what are you waiting for? Enter our competition now! For your chance to win please fill out the following form and answer the multiple choice question correctly. If you're having difficulty entering the competition on a mobile, please ensure that: 1) Your email address is in lowercase and 2) There isn't a space after the email address. What is the name of the largest working waterwheel in the world, found on the Isle of Man? Terms and conditions apply and subject to availability. The prize is non-transferable, has no cash value and is non-refundable. The competition is open to those aged 18 and over who are not employed by the Isle of Man Steam Packet Company. All elements of the prize are subject to availability at the time of booking excluding 22nd May – 12th June and 14th August – 2nd September 2019 and must be used by 15th December 2019. Prize includes: Return ferry travel for 1 x car and 4 x people with the Isle of Man Steam Packet Company on scheduled services from the UK or Ireland to the Isle of Man. Accommodation is for up to 4 x people sharing 1 x cottage for 5 consecutive nights at Groudle Glen Cottages. 4 x Manx National Heritage Holiday Passes, valued at £25 per adult and valid for 14 days from first date of use. Seasonal site opening dates/ times are available at www.manxnationalheritage.im. 4 x entry tickets to Curraghs Wildlife Park valued at £10.50 per adult. Seasonal opening times are available at www.curraghswildlifepark.im. Only one competition entry per person. Entries for the competition must be received by 12:00pm on 14th May 2019. Whilst internet access is required to enter, no purchase is necessary. Isle of Man Steam Packet Company cannot accept any responsibility for entries that are lost, delayed or modified in transit. Proof of entry is not automatically proof of receipt. The competition winner will be drawn at random from the correct answers by 5.00pm on 21st May 2019. The winner will be contacted by Isle of Man Steam Packet Company using the email provided by 24th May 2019. The winner has 7 days to contact Isle of Man Steam Packet Company via email or in writing to inform if they accept or refuse the prize. When the winner informs Isle of Man Steam Packet Company they accept the prize, Isle of Man Steam Packet Company will send the relevant contact details to make the booking and make travel arrangements, always subject to availability, on the prize-winners preferred dates. If after 7 days the winner has not contacted Isle of Man Steam Packet Company, the prize will be lost.